3 chalet blocks, open to the public since 2002, provide 6 apartments to accommodate 2-4 guests. Each bedroom contains a double bed, wardrobes, dressing table. Each living room is equipped with a pullout bed and satellite television. Each apartment has its own bathroom and separate toilet. Each kitchen section is supplied with kitchen furniture, cutlery, crockery and cooking utensils for 4-6 people, hob, sink, refrigerator and coffee and tea making facilities. There is 1 apartment equipped to accommodate 4-6 guests that has two bedrooms as well as a pullout bed in the living room. 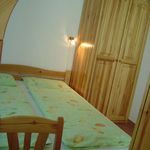 The rooms are fitted with environmentally friendly pine furniture. Children’s playground in our Garden. The rating of Apartman Eman Bükfürdő is 9.2 from the maximum 10, 52 based on actual and valid guest ratings and reviews. "A 8 férőhelyre hirdetett apartman 4 főnek megfelelő annál többnek kényelmetlen." apartmanjaink családi apartmanok, két felnőtt - két gyerek részére szolgálnak. Nyolc felnőtt esetében 4 db szállodai szoba lenne a kényelmes. Weblapunkon szereplő alaprajzok alapján el lehet dönteni, hogy takarékoskodni akarnak vagy kényelemre vágynak. "Parkplatz etwas eng und die Kissen zu dün und zu hart. Wenn es sehr warm ist, kann man kaum schalfen. Klimaanlage wäre nicht schlecht." "Internet - wifi jel hol van hol nincs... inkább nincs..."
"Szauna használat! Tágas apartman... végre elfértünk!" Based on the reviews and comments of actual guests, the services of the Apartman Eman Bükfürdő have received a high rating of 9.2/10.